In operation since 1999, TitanHQ provides businesses worldwide with comprehensive network security protection through their award-winning suite of email and web filtering solutions. TitanHQ has a deep understanding of the complex IT threats that face IT professionals today. All our resources and focus are dedicated to WebTitan. This is our core business and what our R&D team have been developing for near 20 years. For partners, this is a recurring revenue model on a high margin, subscription based SaaS solution that has significant current market demand. 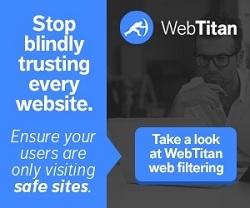 WebTitan blocks access to malware, phishing attacks, malicious & compromised sites, spam based sites and spyware. WebTitan filters URL’s into 53 predefined categories containing over 500 million website addresses in 200 languages. We find and block 60,000 new malware sites daily. WebTitan Cloud for WiFi is a DNS based web filter. It is not a proxy. DNS filtering is becoming a key cornerstone of world cyber security. WebTitan Cloud for WiFi is 100% cloud based with no client installations. It can be rolled out very quickly, easily managed by the user and it is infinitely scalable. WebTitan Cloud for WiFi simplifies WiFi security management. It takes care of the complexities of content filtering and security while presenting a logical interface that requires no training. There are no software installations and no need for technical expertise. WebTitan Cloud for WiFi is one of the world’s leading web filters and has been recognized and awarded regularly across the security industry culminating in a prestigious Red Herring award in 2016. We block millions of webpages and filter billions of emails every month for thousands of global customers. It is not a proxy. Proxies can be very difficult to manage, expensive and cause latency. WebTitan Cloud for WiFi is 100% cloud based, requires no client installations, can be rolled out quickly, easily managed by the user and it scales. Seamless and easy integration into your existing service stack through advanced API documentation. Administrators can manage and monitor the solution remotely saving on costly local installs. Only 14 days free trial required to test and the solution has a very high test to paid conversion rate. Grow your revenue with no investment on your side. This is a recurring revenue model on a high margin, subscription based SaaS solution. As an MSP our biggest challenge was to provide malware protection for 1,200 different customers in multiple locations. Each customer has unique needs and requires a flexible malware protection solution. WebTitan Cloud for WiFi allows MSPs to set up and manage malware protection at any location through an easy-to-use Web interface. Deployment takes minutes, and each network offers Web content filtering and reporting options that can be managed by the customer. We had used OpenDNS to offer web filtering and found them very accommodating at the start offering support and guidance with the solution but once the deal was agreed this all fell away. A key strength of WebTitan Cloud for WiFi is that the people behind the product, support and development are first class. We regularly accept MSP product suggestions and get them implemented. This doesn’t happen with most security companies. As a web filtering service provider we are growing at a staggering rate adding customers to our service daily. Can WebTitan help us sustain this growth? With WebTitan Cloud for WiFi there are no license barriers. You can add licenses daily, weekly or monthly. We offer very flexible plans that work with dynamic licensing requirements without being cost prohibitive. OpenDNS Umbrella is the current market leader in content filtering. They have faced a number of challenges since their acquisition by Cisco. In general terms WebTitan Cloud for WiFi is a direct swap out for OpenDNS and we are seeing lots of activity in this area due to uncertainty in the market. One of the key differentiators is the pricing model: WebTitan Cloud for WiFi is simple and transparent; all features, benefits and support are included in your price. OpenDNS uses a multi-tiered pricing structure with extra costs for advanced features and support. We position ourselves as an independent, affordable version of OpenDNS that allows you the flexibility to host your solution locally. Find out about the profile and sector of the opportunity. Retailer, school, office etc..
How many locations or access points are involved? What’s the profile of these locations? Find out about the infrastructure. What are the major security risks that you have identified in your areas? Have you implemented a control to mitigate that risk? Are you replacing an existing solution? Find details. Is the requirement a security requirement, content control or both?